I'm finally back into a groove at work and haven't really thought to take many pictures. I'm bracing up two new guitars and French polish another that will be available in mid November. 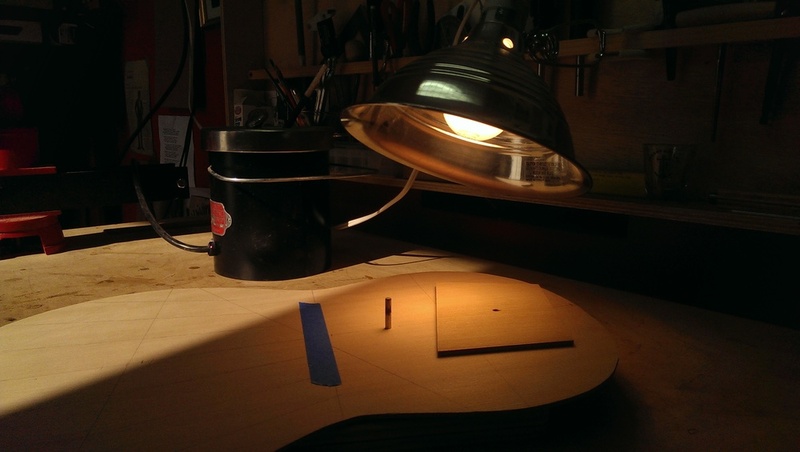 The first photo here is of a sound hole reinforcement patch prior to being glued on. I keep things warm for the glue using a this lamp. This allows for a slightly longer open time and better adhesion. The following two photos are of a bridge for the newest cedar guitar. I've gone back and forth on the little lip behind the tie-block, but I've decided that I like it. The fourth photo is a scarf joint post glue-up; with hide glue and a clean joint, the glue lines are almost imperceptible. I also spent some time this weekend recording local guitarist and Suzuki guitar instructor Robert Vierschilling playing on a number of guitars from the showroom at the Rosewood Guitar Shop including one of my own. I've posted two below, but for the rest, visit the Rosewood Guitar's Youtube page. And lastly, here is a picture of the bridge on a 1969 Ramirez 1a that someone altered to lower the saddle and presumably reduce it weight. Bad idea! Don't do this/let people do this to your guitar! !